Your Best Choice For Geoprobe® Services! The Probing Company is a Geoprobe® Direct Push Services company located in Atlanta, Georgia. We conduct Geoprobe Direct Push Drilling services throughout the State of Georgia. Early in the environmental industry soil and groundwater samples were acquired with mast driven drill rigs, which were more traditionally utilized for installing water wells. These large rigs could not maneuver in tight locations, and had height restrictions due to their mast. We now have and utilize Geoprobe® Direct Push Technology that is a vast improvement over these older rigs. We utilize Geoprobe® Direct Push Technology mounted on trucks so that they can be used almost anywhere. Our truck mounted Geoprobe® rigs allow for drilling to be performed in hard to reach places and across lawns and landscaping due to the lighter weight of the units. The Probing Company is qualified to complete any and all direct push soil sampling at your job site. 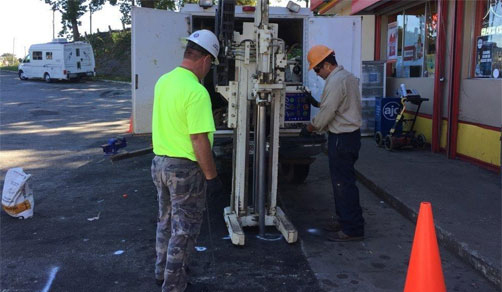 Our Georgia Geoprobe® Services/Direct Push Drilling doesn’t generate soil cuttings like typical augering methods, and is well known throughout the environmental industry as the fastest and most economical way to collect soil samples from a site. The Probing Company utilizes the Geoprobe® MacroCore™ Sampling System, Geoprobe® DualTube™ Sampling System, and the Geoprobe® LargeBore™ Sampling System to collect soil samples as part of our North Carolina Geoprobe® Direct Push Services. Albany, Athens, Augusta, Candler-McAfee, Carrollton, Columbus, Dalton, Douglasville, Dunwoody, Gainesville, Griffin, Hinesville, Kennesaw, La Grange, Lawrenceville, Mableton, Macon, Martinez, Redan, Rome, Savannah, Statesboro, Valdosta, Brunswick and Warner Robins. Georgia Geoprobe® Services = The Probing Company! The Geoprobe® Screen Point 22 (SP-22) sampling device is utilized in conjunction with the Geoprobe® DualTube™ Sampling System. The SP-22 screen is typically utilized after the depth to groundwater has been confirmed by collecting soil samples with the Geoprobe® DualTube™ Sampling System. Once the surface of the water table has been confirmed, the SP-22 screen is lowered inside the Geoprobe® 2.25-inch rods and the rods are slowly retracted 4-feet to expose the screen below the Geoprobe® DualTube™ cutting shoe. With the stainless steel screen exposed, and the water table surface intersecting the screen, clean dedicated tubing is lowered inside the screen and groundwater is extracted utilizing a peristaltic pump and/or a stainless steel check ball valve. The Geoprobe® SP-15/16 is a protected screen, direct push groundwater sampling device utilized for sampling groundwater from unconsolidated materials. 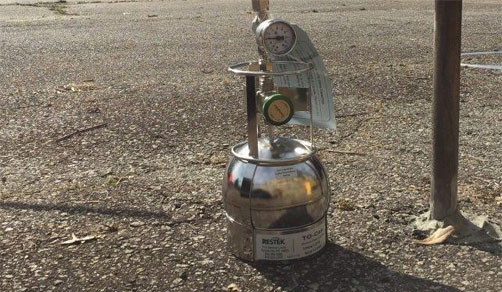 To collect a groundwater sample utilizing this device, a stainless steel screen is inserted inside a stainless steel sheath, and a drive head is attached to the sheath. A steel expendable point is then attached to the other end of the sheath, and a drive rod is threaded to the top. Once attached, the entire assembly is driven into the subsurface using the percussion of the Geoprobe® rig. Drive rods are added to the string of tools as the sampler is advanced to the desired depth. Once the desired depth is reached, stainless steel extension rods are inserted down the center of the drive rods to hold the expendable point in place, and the drive rods are retracted approximately 4 feet. With the stainless steel screen exposed and the water table surface intersecting the screen, the extension rods are removed. The groundwater is extracted using disposable poly tubing and a peristaltic pump or a stainless steel check ball valve.